This is "La République", the statue that symbolizes the French republic which is, quite logically, located at Place de la République! It was built between 1880 et 1883 after the work of two brothers: Léopold and Charles Morice. The red "scarf" does not belong to the original work! It's made of plastic and was probably put there by a bunch of demonstrators (this location is very often used by protesters) just before I took this photo (on Sunday). I found it funny (the blue sky is real, but it's long time gone now!). Ahh the 'red scarf' so French. Would it be silly to say that it reminds me of something close to me? No, I'm kidding!!! sorry! 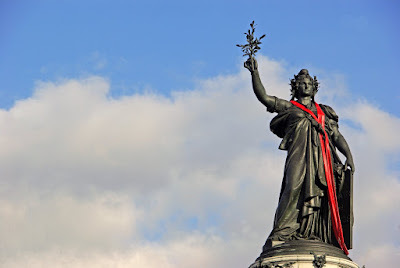 All those French ladies know how to wear a scarf with panache, even giant iron French ladies! This lady was at the center of a protest on my first night in that district 2 years ago. I couldn't sleep! Someone had placed a surgical mask over her mouth- but not over their own mouths! Beautiful composition on this one. I love the colors. The red really pops. I'm laughing about you explaining the the blue sky is real. Has it been that bad? So sorry. So were you protesting too, Eric? Sorry you've lost your beautiful blue sky. I'm with you, Mrs. V. When I lived in Paris I tried to emulate the French girls, who seemed to be born knowing how to make the most of a chic scarf (never could pull it off though). This French girl is apparently no exception. She does remind me a bit of our own Lady Liberty. Maybe we should give her a scarf too—it's bitter cold out there in that harbor! Vive la France...Vive La République!! I always used to love it when the President of la République would give his speech and end it with these words!! Let's see...DeGaulle, Pompidou, Giscard d'Estaing, Mitterrand, Chirac, Sarkozy...just a few of those I remember. LOL!! Flore - you made me think of a Ken Burns show on the Statue of Liberty, that kindest gift of France to America - which I never realized was paid for in large part by thousands of French citizens - by way of raffles and collections. I was very touched. The sky looks as if it were painted! Many people don't know there is a model of the Statue of Liberty on a small island in la Seine near la tour Eiffel and that the model for the torch Lady Liberty holds is on the avenue New York side of pont de l'Alma. I see "Marianne" (with her red scarf) now has the appropriate tricolors working for her in this photo. May sunny skies prevail. Red, White, and Blue. So appropriate. Love it. Love the colors and composition. Great shot. Louis, there is also a statue of Liberty in the Arts and Metiers museum and the Luxembourg gardens! I get so lost in the Place de la Republic. My guidepost is her head, and it faces rue du Temple which helps orient me. I think the statue is also a depiction of Marianne,oui? @ Flore: my heart goes out to you. I am very sorry about your daughter. You are right about this statue's similarity to the Statue of Liberty. . .it served as an influential model for Lady Liberty, actually. @ Eric, I'm glad you saw blue a little blue sky at least. This is a lovely composition. Jilly's Menton blog features a street sign of Place de la Republique today. Oh, the links that run through CDPBlogs! My goodness quite a contrast to yesterdays photo. Quite striking. That red plastic scarf just absolutely made this image! Made me smile, thank you. I like the colors and the blue sky is wonderful. Today's pic takes me back to our first trip to Paris in 1999, we arrived at the Gare du Nord and took a metro to Republique. Our first proper sight, so to speak, of Paris was as we emerged from the metro station right in the centre of Place de la Republique and the first person we saw was a gentleman(?) relieving himself against a tree. I turned to my wife, smiled and said, "Welcome to Paris darling!" It couldn't have put us off as we have been back almost every year since. Agree with your last phrase, Drummond! Good night, I'm already sleeping as I'm writing these words... Such a silly day I've had today! Only able to ... zzzzzz ... tonight. Enjoy your time all, wherever you are. @ Flore: Good grief, Flore. You must think me an idiot! I thought you had written that your daughter was dying, not that she was dying to go to NYC. So sorry! Now I know I not only type too fast, I read to fast, as well. @ Drummond: What a hoot! Great "first impression" story. We have a statue of Lenin here in the Fremont neighborhood of Seattle that often gets special clothing treatment as well. I think the red scarf adds some excitement to this splendid statue. Kim, that's funny! To tell you the truth I did not know what to think of your first comment but I was proud enough that you wrote words to me ! The more I like blogs, the more I like real "live" conversations. I like both actually. La composition est exceptionnelle, on dirait que les nuages la suivent pour appuyer son message..